In most recent times, homeowners are investing a lot of money into searching for ways to improve their bathrooms and create a more comfortable, functional feel. After all, the craziness surrounding our every day lives makes the time in the bathroom some of your only personal time. It seems reasonable to want your bathroom to be soothing, rejuvenating, and practical. Bathroom remodeling is a wonderful way to add value to your home and pleasure to your hectic life. With so many aspects to consider, such as cabinets, faucets and fixtures, flooring, toilets, vanities, showers and bath tubs, bathroom remodeling can often be very overwhelming. Let's start with the basics, the actual layout and floor plan of your new bathroom. The design of your new bathroom is where you should start your planning. Sometimes it is a great idea to hire a bathroom designer to help you optimize your limited space. The bathroom designs shown on TV and in magazines may work well for someone else’s set up, but only those who see your bathroom up close and in personal can create an effective design. If you do plan to design your bathroom yourself, make sure to think about the amount of time you spend in your bathroom each day and use this as a way to rate what needs to be upgraded the most. For example, the more time you spend, the more space you need. To add to your comfort, consider knocking down a wall and creating more room. 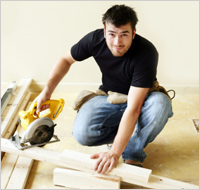 Keep in mind that an estimated 80-85% of what you put into your bathroom remodeling, you get back when you sell. In addition to more space, think about installing fog free mirrors, heated floors, or a beautiful whirlpool. Once you have successfully decided on your new bathroom design, the challenging decisions arise. It is now time to start selecting color schemes, vanities, cabinets, counters, single or double bathroom sinks, bath tubs and every other element that helps set the tone of your bathroom. The bathroom tile may be one of your most difficult decisions solely due to the vast amount of styles, colors, and sizes to choose from. Larger tiles are becoming more and more popular; however, they require the underlayment to be very level. Mosaic tiles, one inch tiles, are another break through in bathroom designs. Mosaics come in countless colors and allow you to create your own custom floor design. Choosing a new bath tub is one of the more exciting remodeling decisions. This is your chance to get rid of that old, uncomfortable rectangle tub and upgrade to something rejuvenating, something massaging, something more like a whirlpool tub or a soft bathtub. Maybe you simply wish to improvement the look and feel of your old tub by covering it with a new shell. Whatever it is, don’t be afraid to pamper yourself, but be smart about where you pamper yourself. Sometimes it is a better idea to upgrade your shower, something you use two-three times a day, as opposed to investing money into a tub that might just sit there unused. Showers are becoming more and more attractive with new technology. Your shower can be turned into a steam room, stimulate hydro massages, and for your convenience they now come in multiple shower heads. The next step is to select a new bathroom sink, faucet, and vanity. A lot of creativity can go into these three essential bathroom elements. Above counter sinks seem to be the new trend for bathrooms. They perform a practical function and can be viewed as art at the same time. Above or beneath, you still need to select the material/s that your sink will be made of. Generally, sinks can be made from stone, marble, glass, copper, and stainless steel. Special custom sinks are also available. The material you choose will depend much on the overall appearance you are looking for. The same holds true for the vanity you select. Your bathroom scheme will be revealed through the material your vanity is made of. Are you looking for a modern or contemporary bathroom? Faucets, on the other hand, function differently depending on what material they are made from. If you are looking for along lasting faucet, stick with materials such as brass and copper. But make sure to select faucets that compliment your sink and vanity.